With petrol prices rising at a seemingly exponential rate and trouble in the Middle East lending more weight to future price hikes, it appears that the UK’s love affair with the car may finally be coming to end. The sad fact is that many of us can no longer afford to make the daily commute to work and we are increasingly turning to other forms of transport that aren’t an incessant drain on our finances. Recent articles have pointed to the fact that fuel sales have recently dropped citing rising prices and a new found interest in environmentally friendly alternatives but, unfortunately, this doesn’t necessarily point to a reduction in car travel. Many of us are turning to cars with higher MPG and in a small number of cases, the electric alternative. However, this often means an expensive initial investment which is not always a viable option. Alongside this, many of us use public transport on a regular basis and car pooling is also a valid option. However, well-known issues over reliability and punctuality – not to mention overcrowding and questionable hygiene – often leave us dreading the first and last part of our day. So what is the answer to this most basic of questions? Simply this. Save money and cycle to work. As the government slowly takes the hint that people are willing to turn to pedal power in an effort to avoid the rising cost of travel, we are beginning to see more incentives for self-powered commuters. Dedicated cycle lanes are becoming part of our infrastructure and discount schemes proposed by politicians enable cyclists to save big money on new bikes. Naturally, there is still a little initial expense but when compared with the huge layout for a new car, you can’t go wrong. Of course the benefits don’t stop there. Why not scrap that expensive gym membership at the same time and get your regular exercise on your daily commute – you will save time, money and the environment in one fell swoop. In addition to this you will spend less money on car maintenance, road tax and the dreaded insurance premium that, regardless of our own careful driving, rises every year. There a yet still more incentives to help you make the switch to a two-wheeled commute. Why not head over to Voucherbox and enjoy large discounts from stores including Halfords and Sports Direct. These do stock a range of accessories that will keep you safe, warm and sporty all at the same time. Kit yourself out in the latest gear and stay one step ahead of cycling fashion – whilst also keeping that pencil skirt free of mud for that all important meeting. Last but by no means least, many studies have shown that, with regular exercise, we receive a boost to our immune system and a greater sense of well-being which often leads to longer life expectancy. Who knows – you might even begin to enjoy the trip to work everyday rather than dreading the crush for the tube or the sour smell of a damp bus on a rainy Monday morning. 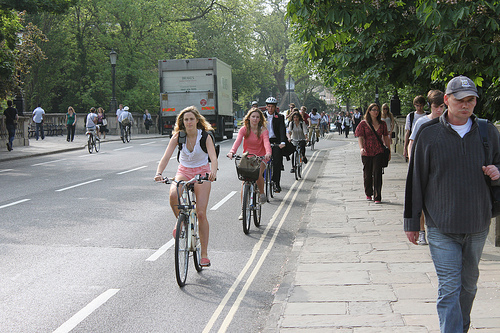 I love cycling and would suggest that everyone at least consider cycling to work. Most employers in the UK also offer the cycle to work scheme meaning that you can pay for your cycling expenses pre-tax.